Today in an Australian Senate Committee meeting room a fundamental and essential change happened. 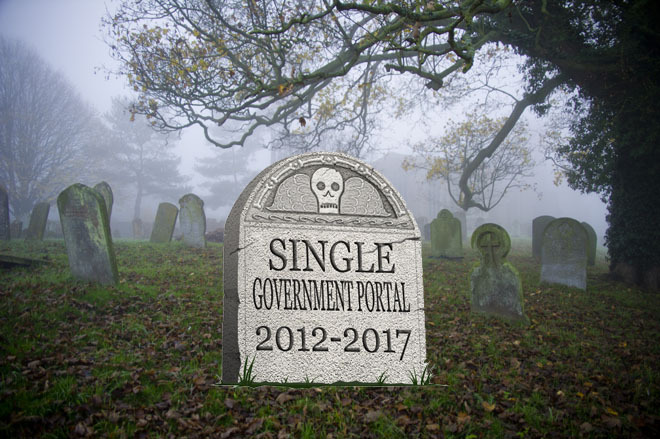 The idea of a single government portal to rule them all was quietly buried. Now, I’m not saying a proliferation of government websites is the way to go. Far from it. But what this does mean is the pre-eminence of customer centred digital service delivery has at last prevailed over dogmatic ideology. So it is encouraging that a few months after former head of Australia’s Digital Transformation Office- Paul Shetler was politely shown the door, the interim head Nerida O’Loughlin has provided the much needed leadership to unite Australia’s service delivery environment. Government organizations had been largely run roughshod by Shetler. Before starting in Australia he’d done exactly the same thing in the UK. And we all know how badly that turned out! So a total lack of departments owning the process had a big impact. But that alone should not be the reason to kill off an initiative like this. It clearly runs deeper. Ms O’Loughlin outlined a fortnight ago that a business case found that instead of a single government website, there were better ways of improving government digital services. While the business case hasn’t been publicly released, governments worldwide can encouragingly nod their heads. Australia is a developed G20 nation. Until recently they were in lock-step with the UK’s single minded strategy. So for a business case to find the concept wasn’t capable of achieving the government’s desired objectives is a big step forward. I have seen volumes of research across multiple tiers of government and across the globe showing business customers overwhelmingly want government to prioritise their access to services over citizens. They don’t want to be lumped in with endless citizen services and hate the headache of trying to find what they need for their business amongst the clutter of G2C services. Another positive step forward by the DTA is its focus on content strategy development across government to a more customer centric model. The Australian Government is continuing its drive to reduce the number of its sites while supporting digital design around customer needs instead of government department structures. This is another big win for business customers in Australia. It means the government’s drive for an enhanced business customer experience at www.business.gov.au is likely to improve even further. Ms O’Loughlin also highlighted the DTA’s technology focus will increasingly be around creating enablers that support agencies deliver services to customers. Initiatives like a whole-of-government identity platform and tell-us-once capability are essential pieces in any government’s digital toolbox. Customers don’t want to have to manage endless accounts, passwords and means of authenticating to transact with government. Likewise if they relocate. Telling government agency after government agency makes no sense in the customer’s mind. In their mind it’s all government. Once they have proved who they are, shouldn’t government just share the new details across agencies? In Nordic and Baltic cultures they inherently expect this. With their government identity cards and other credential mechanisms they see the silos across many government in the world to be absurd. That may be true, but it’s the reality for many governments. So the fact that Australia is starting to address this is a big step forward. The devil of course will be in the detail. Particularly managing the differences in identity management between citizens and businesses. Often business structures and individuals’ roles in those businesses present a range of challenges in managing different corporate responsibilities. Likewise where a business owner, or owners, have delegated accountants or employees to perform certain activities but not others. But business versus citizen account management is a story for another day. Another really positive step is refocusing the DTA to review and support agencies’ ICT projects. Now this could sound heavy handed, but Ms O’Loughlin was crystal clear that this is to be a true partnership. Agencies will continue to be exclusively responsible for the delivery of their projects. The DTA will instead look at how it can enhance delivery to ensure projects work better for the customer. In addition it would provide a government-wide perspective in reviewing budget bids for ICT projects. These are really positive steps in the Australian Government’s stance on the digital customer experience and achieving value for money. What are the key take-aways for your government? For the agency who’d benefit most from the additional resources and profile of a single government portal finds the concept doesn’t stack up in the business case; it doesn’t stack up. Don’t go there. Ensure a customer centric view of service delivery is in place and raise standards to better meet business customers’ expectations. This should involve understanding business customers’ journey with government, joining up the services of those government agencies and ensuring it’s an intuitive and easy to use experience. Provide central agency digital delivery expertise to government departments to support their service delivery to business customers. Engage with agencies and customers to deliver technology enablers that make transacting with government easier and better.